Only the most minimal amount of acting is required to sustain this latest encounter with Everest. Though purportedly centred on the epic human endeavour of conquering the world’s most fearsome icy mountain peak, this is a film that’s almost entirely about the spectacle, the awe-inspiring scenic vistas and, most significant of all, the series of disaster scenarios that hope to create tension and drama. 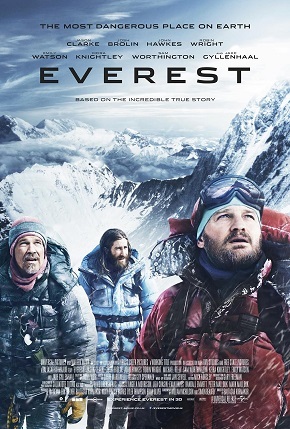 Recounting the trek of a group of tourists being led up the mountain in 1996 by trailblazing New Zealand businessman Rob Hall (Jason Clarke), Everest (2015) offers scant character sketches by way of introduction to the men who’ll partake in this adventure of a lifetime. Other than Hall, these include Beck Weathers (Josh Brolin), a Texan – damned if that isn’t the only fact I can immediately recall about him; Doug Hansen (John Hawkes), whose health is an issue and who will clearly be pushing himself to the limit one last time, God help him, for Everest glory. Sam Worthington and Martin Henderson appear and disappear like ghosts, while Jake Gyllenhaal’s Scott Fischer is a young upstart, the laid-back leader of another tourist venture who Hall would like to join forces with. Then there are the haplessly marginalised female characters, the tortured wives doomed to suffering ‘back home’ and given the skimpiest of material to work with. Keira Knightley, dodgy New Zealand accent and all, is Hall’s pregnant partner, whilst Robin Wright is handed the equally onerous task of breathing life into a faded sketch as Beck’s wife Peach back in the States. Closer to the action, at base camp, is Emily Watson’s hen mother Helen Wilton, providing the line of communication between the front line and the anxiously awaiting womenfolk. Other shortcomings in William Nicholson and Simon Beaufoy’s painfully hollow screenplay draw attention to their virtual non-presence. Even more skimpily depicted than the females are the all-important Sherpas whose back-breaking, integral participation is reduced to a couple of perfunctory scenes, references and mediocre jokes to show that they’re nothing if not a slap-happy bunch whose amiability seemingly negates any tiresome need to reveal any human depths they might possess. Soon to be seen on our cinema screens is Jennifer Peedom’s glorious Sherpa (2015), a film that, beyond its visual grandeur, dignifies and illuminates the extraordinary breadth of the Sherpas grit and courage in the face of elemental forces and economic calamity. Baltasar Kormakur’s film is a far less interesting cinematic proposition; in fact it’s possibly the most deadly dull ‘epic adventure’ in recent studio history. With its wind-strewn, comprehension-disabled dialogue, stumbling men rendered anonymous under layers of face-contorting clothing, cringeworthy collection of fake Kiwi accents, and depressingly perfunctory dialogue, Everest stumbles into each murky crevice of cliché armed with well credentialed actors who surely signed on the dotted line for the promise of a getaway and a well paid fitness regime. Tension and drama are absent from every threat posed by the falling, collapsing, clamouring icy chunks and boulders. Even worse, a woeful sense of familiarity has its own sweet way with the entire production, making the ascent to and descent down Everest’s peak as torturous for the audience as it is for the players. Is there anything more depressing than seeing genuinely fine actors, best known for a series of genuinely interesting creative choices partaking of something so awful, so blatantly commercial and allowing themselves to be made into a cardboard cut-out of a human being, an imposter whose part is either marginal at best or whittled away to noting in the editing room? Is this really the same John Hawkes who has forged and truly earned his reputation as one of American independent cinemas finest actors in recent times thanks to his unforgettable roles in Winter’s Bone (2010), Martha Marcy May Marlene (2011) and The Sessions (2012)? Fair to say Everest won’t be a film he’ll use to highlight his talents to his succeeding generations or even prospective employers from this day onwards.